This post is part of a series reviewing different subscription boxes. I first tried BarkBox over a year ago, when I first got my own dog. I was so excited, because I’d been waiting since I started college to get him – my parents’ graduation present to me. I wanted to welcome my furry child Leo to our home by spoiling him with treats and toys, and BarkBox seemed like a great way to do that. Fast forward to today – one of my favorite old coworkers from Groupon now works for BarkBox. He’s the perfect fit for the job – he loves dogs and recently got a Shiba Inu that he loves to death (and now gets to bring to work!). He hooked me up with a free box so that I could share with you what a typical BarkBox looks like. If you’re wondering what to expect, this should help to answer your questions. These are good treats to have on hand that pack a nutritious punch. I usually shy away from treats with ingredients like beef liver (I have weird food aversions even if I’m not the one eating it! ), but obviously dogs don’t have any problem with those tastes. If you like supporting local farmers and businesses, then you’ll feel really good about giving your dog these treats (and reordering them if your dog falls in love). The ingredients are 100% sourced locally! Leo is not as excited by toys as he was when I first got him, but he loves toys with a squeaker. He also loves to get new things about as much as me, so this went over well when I first gave it to him. Same notes as the previous toy, but this one was designed to be more safe for dogs. What I like about it is that it’s flat and easy to store. This was a larger treat for a small dog. Before ordering a BarkBox, the system prompts you as to what size dog you’re buying it for (based on weight). 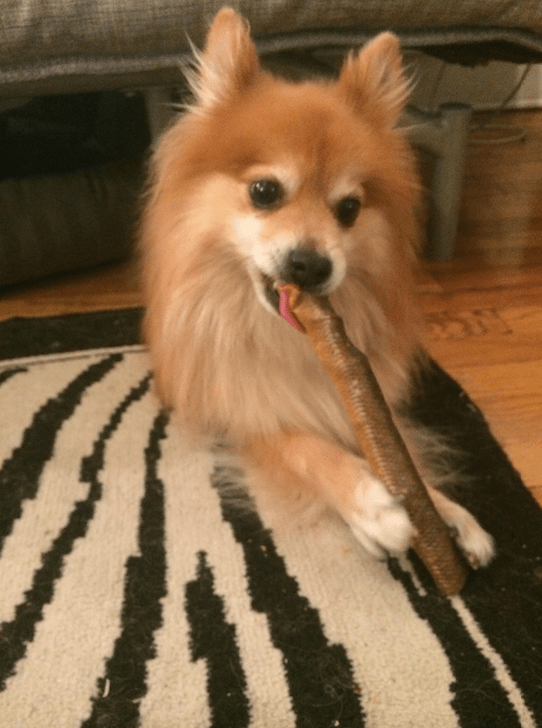 Although this treat was physically large compared to Leo, he enjoyed the hell out of it. It was cute to watch him consume it, and it was gone in minutes. Definitely a special treat I’d get for him again. The only downside – it’s crumbly. Hopefully your dog is good at cleaning up scraps! 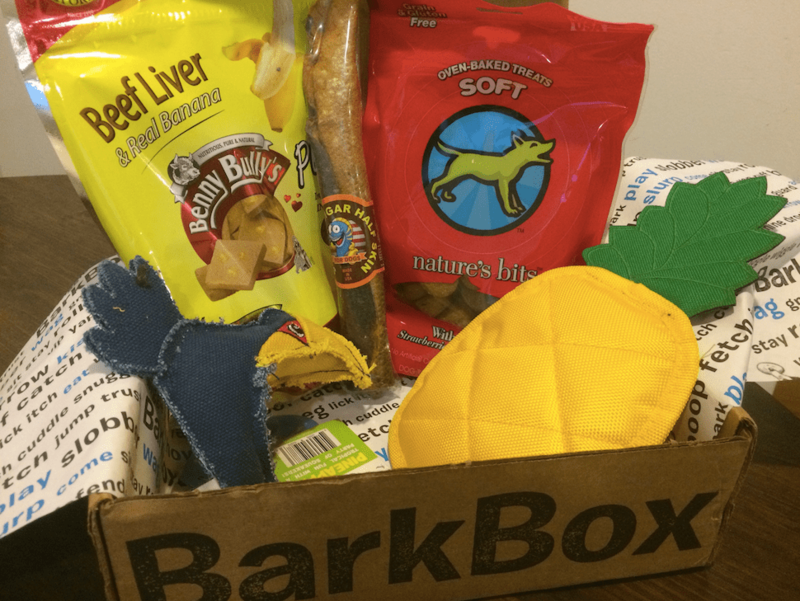 Depending on what plan you get, BarkBox subscriptions range from $19 to $29 per month. Obviously, the more months you buy upfront, the better discount you get overall. BarkBox does lot of promotions for first timers (at least one month free or free premium toy upgrade each month), so sign up for their emails to start receiving the offers. Besides promotional, the emails always have fun pictures and stories for dog lovers, which I enjoy. Overall, I love BarkBox. There hasn’t been one I disliked. Leo usually loves the toys and demolishes the snacks. Sometimes you’ll find handy extras you wouldn’t think to get – one I got awhile back had a medical wound spray that could really come in handy. I guess if I had to critique anything, it would be the number of snacks. Leo is a small dog and I like to give him treats, but I don’t want to overfeed or completely spoil him. There are just so many that by the time you get next month’s box, you’ve maybe given your dog half of them (or less). That’s actually the reason why I originally cancelled my Barkbox subscription – I was overstocked on treats! My suggestion would be to start with a 1 or 3 month box and see what you think. If your dog powers through snacks and toys, consider a 6 month or one year box. I promise you won’t be disappointed! Have you tried Barkbox yet? Tell us about your experience in the comments.